One single projector can work for most homes, but if you add more you will get a better and brighter affect. Christmas laser light projectors work best when placed 25-40 feet away from your home. The further away, the less bright the stars will appear on your home but the more area they will cover. Also, ambient light will play a huge factor in how bright this projector displays on your home. If you live in an area with less light pollution, the affects will be more dramatic. Check out the video below for some more information on the projector and see one of the best Christmas laser lights in action. Q: I turned on my Star Shower Motion and nothing happened, what gives? A: To save electricity, Star Shower Motion has been designed to only turn on in the dark. Test the unit in a dark room. 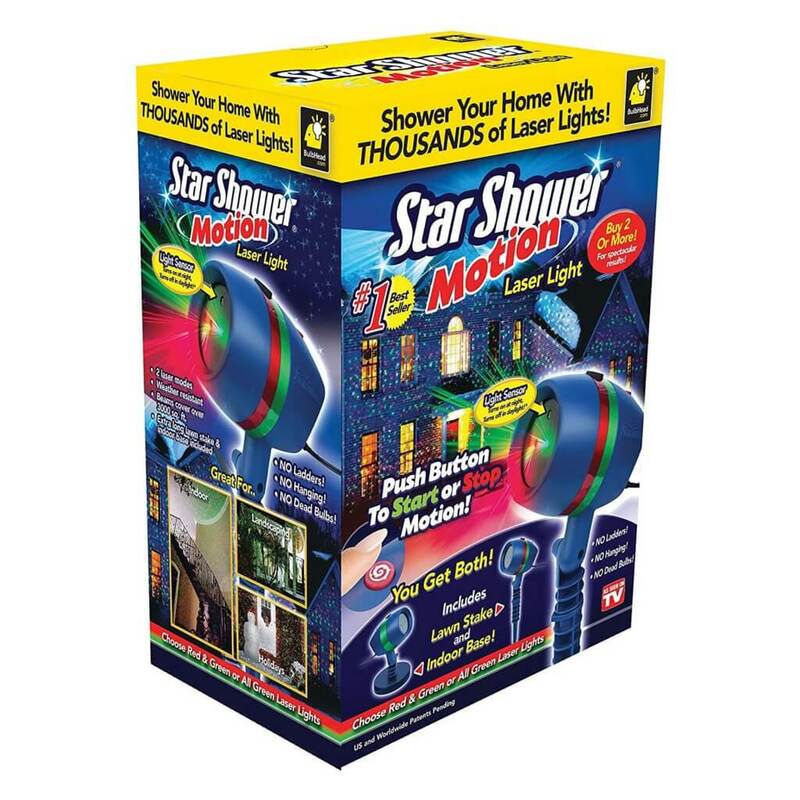 Q: Is the Star Shower Motion battery operated? A: Star Shower Motion is not battery operated, but comes with a foot long, 2-prong wire plug. You’ll need to run an extension cord to the unit from an outlet. Q: How far away can the Star Shower Motion project? A: Star Shower Motion’s ultra bright laser lights can project from 100 yards away. The closer the projector, the less area it will cover, but the lights will be brighter. Q: Can the Star Shower Motion withstand extreme cold? A: Star Shower Motion can withstand temperatures as low as -30 degrees Fahrenheit/-35 degrees Celsius and as high as 100 degrees fahrenheit / 40 degrees Celsius. Q: Is the Star Shower Motion safe to use everywhere? A: Lasers must meet rigorous FDA regulations and Consumer Product Safety standards. Star Shower Motion should be pointed directly at your home and never directly into the sky. Lasers should not be projected at or within the flight path of an aircraft within 10 nautical miles of an airport. If your intended surface is within 10 nautical miles of an airport, lower the angle of the Star Shower Motion so that no lasers point into the sky. Q: Is the Star Shower Motion dangerous to use indoors? A: Star Shower Motion lights are safe as the laser is defracted but neither pets nor people should look directly into the lens for any extended period. Q: How long does the Star Shower Motion last? A: The bulbs have been tested for great durability and should last at least two years. 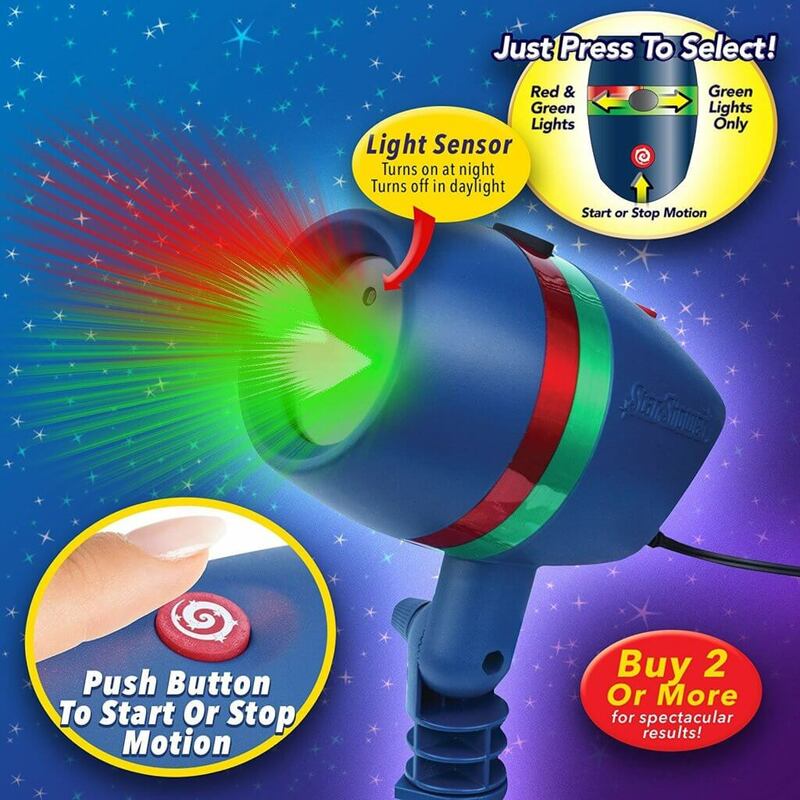 The Star Shower Christmas laser lights projector is rated to work in all weather, but just keep in mind you may need to go outside to clear snow off of it after a storm! You can also check out our guide for the best Christmas yard inflatables to ramp up your holiday spirit! View Star Showers Motion on Amazon!